One of the first blog events I ever participated in was Taste and Create, hosted by Nicole over at For The Love of Food. I still remember the delicious Apple-Banana Bread I picked from my partner, A Whisk and a Spoon's blog. Delicious ... and something I never would have chosen to make on my own. I don't like to bake so I rarely do it. I find that I skip over those sorts of recipes and usually don't even think about making them. That's the great thing about the Taste and Create event; it can push you outside of you comfort zone a little and let you try something different. Usually with great results. This month I was paired with one of my favorite bloggers: Bellini Valli of More Than Burnt Toast. I had big plans because looking at her blog, I couldn't decide on just one recipe. I mean with recipes like Greek-Inspired Chicken Burgers or Greek Salad with Oregano Marinated Chicken, or Bourbon and Brown Sugar Flank Steak with Garlic-Chive Mashed Potatoes, I could plan the whole menu for next month just from this blog! (Can you hear my family in the background saying "Please do!!" LOL!) Reality intervened and before you know it, it was time to post my Taste and Create Dish. 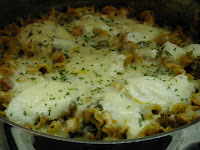 I looked around to find a recipe that I already had the ingredients for and came up with Skillet Lasagna. I figured it would be good. It's pasta. It has cheese. Gotta be good, right? We all loved it, and that doesn't happen all that often around here. All three kids ate it and commented how good it was. Picky ds even asked why I hadn't made this when his friends spent the night las t weekend! Woohoo! Definitely a keeper. :-) (Shhh! Don't tell them it had spinach in it! Somehow they didn't notice.) I did make a slight change. I used Italian sausage instead of ground beef. And I added some sauteed onions and garlic as well. Quick easy and delicious. And all the kids liked it. My idea of a perfect recipe! This month's event is being hosted by Min from The Bad Girls Kitchen. 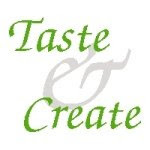 Be sure to check out this month's Taste and Create event! Add noodles and spinach to pan. Cover and simmer 5 minutes (10 minutes if using Mafaldine), stirring. low and cook 3 minutes until cheese melts. Remove from heat; serve from skillet. I'm loving this - such a great meal idea! i've missed participating in T&C lateley! 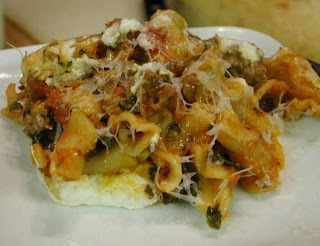 this looks great--love lasagna! I am so glad you enjoyed this recipe. I quite often add garlic, onions or sun dried tomatoes to this as well. What's not to love about quick and easy!!!!! Looks. So. Good. Nothing like lasagna for the upcoming cold winter months.